Folding bikes are practical, lightweight, compact, stylish and are a major hit around the metropolitan areas due to how easy they are to get around on when traffic is constantly backed up. There are thousands of folding bikes out there from various manufacturers that can range anywhere from $100 to up to $1,000. We’ll count down 5 of the highest rated folding bikes on the market and the best part is, they only range from $200 to $500 so they’re in the medium price range making them affordable while maintaining their high quality. 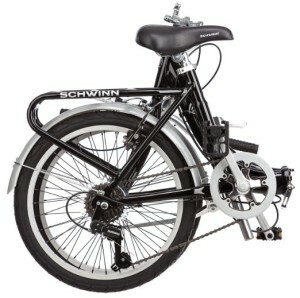 The Schwinn 20 inch loop 7-speed folding bike was designed for practical city traveling and commuting in mind. If you live in an area that frequents a lot of traffic or has complex roads such as those of suburbia California, you’ll be able to get around much easier. When the bike is folded, it will fold down to a perfect 30 x 32 x 11 inches. It’s an ideal carry on for small planes that will allow folding bikes to be carried on and it doesn’t take up a lot of closet space in your home. The bike comes equipped with a low standover frame which allows anyone to hop on without reaching or putting in a lot of effort to mount the bike. Braking is important. 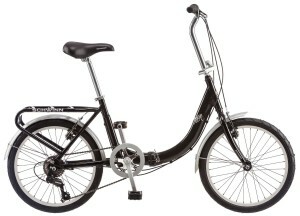 In the city, you never know what you’ll run into or what could run into you, so the Schwinn 20 inch loop 7-speed folding bike comes equipped with a linear pull braking system that can stop instantly at almost any speed. If you prefer to go fast or need to get up a hill, there are 7 different speeds to give you a wide variety and range of gears for pedaling. If you need to carry something, the bike comes equipped with a rear cargo rack on the back and a free nylon bag that’s heavy duty for anything you might need to carry with you. Six patented technologies went into designing and constructing the frame of the Mariner D7 folding bike. The tubing is Sonus custom drawn. Most boats have very compact or limited space such as liveaboards and low budget cruise ships. The Mariner D7 is light, compact and will fit into any confined space you’ll encounter on a boat or ship. When you port or arrive at your destination, you can simply unfold the bike in a mere matter of seconds, like pitching a perfect tent. The only downside is that while the Mariner D7 does come with rust resistance technology, there will be some maintenance required to keep your Mariner D7 up to date and rust free. If you don’t maintain it, it will become corroded and rusted because of exposure to humidity and moisture. If you’re riding to the nearest café in a town, just running some errands or picking something small up such as a package, this is the perfect bike even for people that don’t travel by sea. You don’t have to go on boat rides to enjoy the Mariner D7, even though the design was made for practical use for sailors and people who travel by sea a lot. The philosophy of the design was that it should fold fast and it should fold small because, with most boating trips, you don’t get a lot of time to explore or do things once you dock into a port. It’s also great for people in a hurry and on the go when they’re on their way to work. Unlike a lot of manufactured bikes, this bike is always brand new and 90% of it is already assembled via the factory. The Kenda 26 aims to combine style and convenience into one. 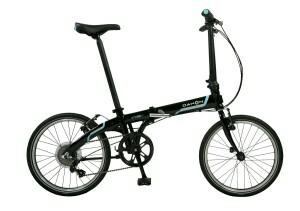 The bike is very lightweight at a mere 34 pounds and is one of the fastest folding bikes out on the market. However, this bike isn’t the smallest bike out there on the market and you probably won’t be able to take it with you on flights, boating rides or anywhere where there’s a confined space. The folded dimensions are as follows: 38 x 14 x 29 inches. While it’s not the smallest, it’s great for storing this bike for a road trip or in a camper so that you can ride around and explore the area once you arrive at your destination. This bike is mostly used for outdooring adventures such as the park, going on an off-road track or getting around a campground quickly. The bike is recommended for people who are in between 5 foot 3 inches and 6 foot even. People taller than 6 feet may end up having to customize the seat or buy a bigger seat post altogether. The maximum weight capacity for this bike is up to 200 lbs. If you’re a bit heavier, you might need to consult one of the other four bikes on this list for your needs. The bike is approximately 34 pounds with a shipping weight of 43 pounds. While 90% of the bike is manufacturer built, upon receiving the bike, the front wheel will not be installed. The front wheel, however, is very easy to install to complete and it takes the average user five minutes to install the wheel. Consult the manual that comes with the bike for a detailed explanation of how to install the wheel. The color varieties are as follows: Blue, yellow, silver and black. The Vybe D7 comes with a 7 speed Shimano adjustable speed setting for fast traveling or slow pacing. Hills shouldn’t be a problem with a max setting that could easily carry you up almost any incline including the hills of South Korea. The Vybe D7 was designed with metropolitans and road travel in mind. It was built with an aluminum lightweight frame and can hold a ride of max capacity weight: 230 lbs. The suggested rider height for this bike varies greatly and is adaptable to most people: Anywhere from 4 foot 8 inches to 6 foot 4 inches. It’s not the smallest bike however and not the largest on this list, the folding dimensions come in at 26 x 13 x 32 inches. If you are going to be commuting and using public transport regularly then you will need to choose a folding bike that folds quickly and easily without getting yourself covered in oil. 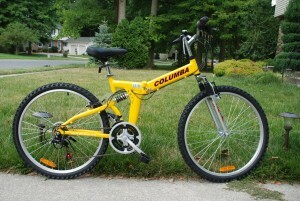 A folding bike can decrease its size at least by half when folded. The frame design and wheel size will decide how compact a folding bike is. If your commute involves carrying your bike then this is an important factor to consider. A lightweight folding bike will allow you to carry it everywhere easier. Make sure that the fare of your bike is made with good material and design is good. Because the frame will affect the durability and weight of the bike. It’s a good idea to match the gear range with the uses that you want to put your folding bike too. If you live in a hilly area then you will want to check the range that the gears provide. Some folders can now match the range of a standard mountain bike. The Bike Friday, custom built in the USA has a range of bikes to suit all purposes but is a separable rather than a folder. The Brompton now have Wide Range gearing that can be set very low to handle hilly areas and not be compromised in the downhill sections. Check what luggage options there are for the bike. What will your needs be for commuting, recreational or touring? Try to avoid having a rucksack on your back as this will make you soon uncomfortable. Is there adequate rack and pannier space? Will the luggage on the front of the bike interfere with the front wheel steering? 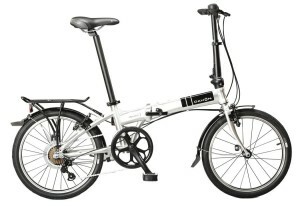 Price of folding bikes tends to be more than regular bikes but they are affordable right now. Price ranges from $100 t0 $2000. Choose one that most fit your budget. The key to a good folder is that it should feel like riding a standard sized non-folding bike. To do this the wheelbase length of the bike should be similar to the standard adult bikes. Generally the large the wheel of the folder the more stable it may feel whilst navigate tricky road conditions. I have used a Brompton for a number of years and was amazed how it felt just like a normal bike despite its smaller wheels. The steering is more sensitive and you will get a firm ride from the high pressured tires. You will need to test out a few bikes to get a feel for what suits you. Most bikes will have some kind of seat height adjustment to suit taller riders. Saddles are mostly interchangeable. I have upgraded mine to a Brooks B17 vintage saddle which I use on long tours. Check how the bike freewheels and whether there are tire options for its use off-road. Again I have traveled for miles on the Brompton off-road with a touring pannier and rucksack and haven’t had any problems with the tires (Kevlar) or bike.